Marcus Haber handed Dundee another precious victory as the Dark Blues continued their revival under Neil McCann with a 1-0 win at Kilmarnock. The Canadian grabbed his second goal in as many games to move the Dens Park outfit four points clear of the relegation play-off spot. But the result will set Killie nerves jangling again as their lead over 11th-placed Motherwell is cut to six with three games to play. Killie were first to threaten when Sean Longstaff fired straight at Scott Bain three minutes in. 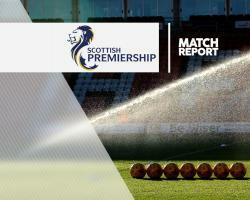 But Dundee, buoyed by their first win under interim boss McCann last week at Motherwell, ended the first period disappointed not to be ahead after creating a string of chances. Mark O'Hara could have gone for goal himself as he was left in space inside the Killie box, but instead squared for Haber, who could not beat Freddie Woodman. Kevin Gomis had the ball in the net after 23 minutes but was flagged for offside after getting his head to Kevin Holt's long free-kick. It is that point of the season when strong stomachs are required, but assistant referee Andrew McWilliam was left red-faced in more ways than one after throwing up by the side of the Rugby Park pitch. Referee Craig Thomson saw the funny side as he flashed a red card at his colleague, but McWilliam was able to continue after taking a moment to compose himself. The travelling Dark Blues support could be excused for feeling sick themselves 10 minutes before the break when Haber somehow headed wide from just six yards. Killie's Greg Kiltie came close to finding the opener just after half-time, although he knew little about it after Bain slammed a clearance off his face from point-blank range, with the ball ricocheting across goal before bouncing wide. But it was the visitors who struck the decisive blow after 55 minutes, with Haber netting at the third time of asking when he got his head to Paul McGowan's ball into the six-yard box. Gary Dicker put a header wide as Kilmarnock looked for an instant response, while Gomis was lucky to survive what appeared to be a clear handball in the area. Dundee were beginning to feel under pressure, but Jordan Jones failed to punish their defence for backing off when he tugged wide after darting into the box. O'Hara wasted a golden chance to relieve the tension by heading wide, while Kiltie and Kris Boyd were brilliantly denied by Bain before Dicker failed to find a leveller with the final kick of the game.